Argentina: Romero; Basanta, Garay, Demichelis, Zabaleta; Biglia, Mascherano, Di María (Pérez, min 32), Lavezzi (Palacio, min 70); Messi and Higuaín (Gago, min 81). Belgium: Alderweireld, Van Buyten, Kompany, Vertonghen; Witsel, De Bruyne, Fellaini, Mirallas (Mertens, min 59), Hazard (Chadli, min 75) and Origi (Lukaku, min 59). 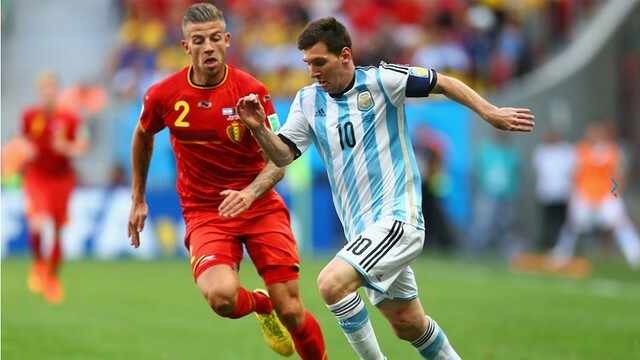 Despite a number of changes in the Argentina line-up, Mascherano and Messi kept their places in midfield and attack. Whatever Sabella had in mind, it worked a dream. A move started by Messi in the 8th minute ended with Higuaín firing an unstoppable – and match winning – volley past Courtois.